The opening minutes of Dunkirk, the latest from superstar auteur Christopher Nolan, get a lot of work done without saying much. 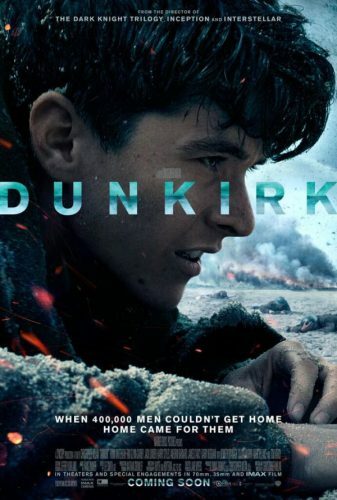 An intricate production design gives way to an explosive street chase, our mostly mute guide through the film’s main plot-line (newcomer Fionn Whitehead) is introduced, and we spill into a sense for the paradox that was the Dunkirk evacuation’s inert frenzy. This economy of place-setting speaks to the rest of the film’s overall leanness, and makes for some stellar war cinema in its no-frills, immersive approach. Of course, immersion is a funny thing these days, as it marks so much of our entertainment media and has become something of a marketing buzzword for reps from theme parks to tech. In this way, Dunkirk provides another example of video-game creep, the clear trend in filmmaking towards borrowing both aesthetic and narrative elements from an increasingly popular and competing medium. This is not to say that the film cashes in on a trend to get its points across. In fact, there is a patina of tradition on Dunkirk that cuts across decades of influence. From the analog battle effects contemporaneous to its setting, to the handheld location shooting and morally cloudy characters of the New Wave, the film is a study in learning from old masters as much as it is in bringing an old story to a new audience. By this same token, Nolan has deviated from his formula of pop philosophy. The cumulative result is the director’s most focused and honestly realized film to date. It is nothing new to point out Christopher Nolan’s penchant for “cerebral” filmmaking, whatever the term might entail. But Dunkirk sees the writer/director working with a slightly different model, one that sinks subtext a little deeper, broadcasting its ideas with a bit more subtlety than usual. The result is rewarding, yielding a purer cinéma pur that doesn’t get all that bogged down in theory-laden exposition or conceit. Perhaps the lack of bells and whistles stems from a place of respect, some innate patriotic sense that says the sacrifices made during this historical week-long trial provide enough heraldry on their own. Or it could be an admission that the details don’t really require much enumeration. It’s a familiar enough story as far as WWII tales go, and there’s a fairly succinct preface to open the film; besides, the event’s been dramatized on film before, with examples like 2007’s Atonement and a 1958 film of the same name (featuring Richard Attenborough, whose grandson Will has a part in Nolan’s film). In short, scores of French and British soldiers get pinned down and surrounded by the Germans in the French-side Channel town of Dunkirk, forced to wait for evacuation and getting slowly decimated by foot-soldiers, planes, and U-Boats in the process. Nolan approaches the telling from several angles: a young private (Whitehead) scrounges his way through survival and charts his own course through the evacuation; a civilian (Mark Rylance) pilots his ship in service of Her Majesty, traveling to the battle zone to help with the evacuation and picking up a shell-shocked soldier (Cillian Murphy) along the way; an ace pilot (Tom Hardy) holds his own amidst wave after wave of German warplanes; a stately but harried officer (Kenneth Branagh) serves as a sort of chorus, walking the audience through the strategic stakes of the evacuation via brief moments of dialogue. As the Rashomon-ish storytelling might imply, the straightness with which Dunkirk is played doesn’t mean that Nolan avoids his usual trickery outright. Enigmatic time constructs make an appearance, as does the inversion of planes (of both the geometric and mechanical varieties, this time). Ultimately, Dunkirk comes off as a film in which Nolan has command of the trademarks that work in service of his film, instead of vice versa. But Dunkirk is also not without its sensory overload. Aside from the general “race against time” tension of the film (notably, Nolan cites Unstoppable and Speed as influences; and his ticking clock shows up here too), there’s a sound design that’s best described as aggressive, with a bullet. To some, the mix put together by (frequent Nolan collaborator) Richard King & co. may come off as a miscalculation. Gunshots, plane engines, explosions and alarms all dominate the aural landscape of the film, met with a frenetic Hans Zimmer score (as ever) that matches the pacing. As a result, character dialogue competes for attention, drowned out and dredging up old complaints around Nolan’s mumble complex. For what it’s worth, I think the deliberate bombast works. It takes the immersion approach from novel entertainment to a space of pathos, as I left the theater somewhat jangled and thinking about the literal implications of the term “shell-shocked.” Furthermore, because of the aforementioned visual pureness of the film, the loss of dialogue doesn’t really frustrate an understanding of the narrative. Ironically, in one of his loudest films, Nolan shows an ability and appreciation for quiet. While the extreme nature of the stimuli could easily lend itself to empty spectacle, there’s something more at work here. Political readings are especially unavoidable when approaching a war film. While Dunkirk is not without its tearjerker patriotism, it leaves plenty of room for cynicism. Whitehead’s Tommy is a weasel with a code of honor, scheming ways onto transport ships out of Dunkirk with a mute companion (Aneurin Barnard). The rookie sells a tricky role, playing through calamity and moral ambiguity with polite desperation. In some way this pair throws a line to the “angry young men,” the British writers of the ’50s who railed at social restrictions and class disparities through characters pitted against various institutions. Tommy’s arc is such that the spirit of this cynicism is kept very much alive, especially as it intersects with the other stories in the film. Like the private tragedy that plays out on Mr. Dawson’s (Rylance) boat, a tightly knit complex drama that provides both slightly jingoistic sentimentality and an honest reflection on the mental health of war veterans. We’re left not quite knowing what to do with Cillian Murphy in this thread, an ambivalence befitting an uncomfortable subject (and providing a slight upgrade from Murphy’s usual, always enjoyable, sliminess in Nolan’s recent films). And in Farrier (Hardy), Dunkirk finds a vision of self-determination amidst the machinations of global warfare, consequences be damned. Hardy channels his performance in Locke as a veritable man apart, prowling the skies, surveying the carnage from his cockpit, and providing something like comfort in the chaos. The sum of these angles is still the sort of inspirational messaging about the indomitable human spirit reserved for blockbuster war and sports movies, but that ethos is at least flavored with a pang of bitter irony in Dunkirk. As so many of Christopher Nolan’s films are about memory, it makes sense that he would tackle the historical war epic. In service of this theme, there’s a rhythmical recall of certain images and sounds. It’s not so much a film that uses repetition as a tool as it is a meditation on the nature of resonance. A group of boys tosses rocks at a metal drum, echoing the pings of gunfire. Water rises, again and again, as if to say that the swelling tides of time will not be deterred. Even the constant barrage of threats for all involved, an “out of the frying pan into the fire” string of obstacles, takes on a certain familiarity, a doomed choreography. A flashback sleight of hand somewhere in the second act provides a partial plot reset, accentuating a sense of existential stasis for the soldiers. This state of being caught, stuck in a current of time, is perhaps a nice metaphor for the act of cinematic reenactment. We pluck these stories from history and keep them with us, sometimes just remembering for the sake of it. In this way, Dunkirk does resonate, even without saying much. Posted in Side Shots Film Blog and tagged Christopher Nolan, Dunkirk, War Films. Bookmark the permalink. Trackbacks are closed, but you can post a comment.